In 1634, the Earl of Strafford(Wentworth) held a council in Portumna Castle, in order to establish the King’s title to the estates of Connaught, which being negatived by the jury empannelled for that purpose, the Earl placed both the jury and the sheriff under arrest and sent them prisoners to Dublin. Wentworth ignored Charles’ promise that no colonists would be forced into Connaught, and he raked up an obsolete title—the grant in the 14th century of Connaught to Lionel of Antwerp, whose heir Charles was—and insisted upon the grand juries finding verdicts for the king. One county only, County Galway, resisted, and the confiscation of Galway was effected by the Court of Exchequer, while Wentworth fined the sheriff £1,000 for summoning such a jury, and cited the jurymen to the Castle Chamber to answer for their offence. In Ulster the arbitrary confiscation of the property of the city companies aroused dangerous animosity against the government. His actions in Galway led to a clash with the powerful Burke family, headed by the aging Richard Burke, 4th Earl of Clanricarde. Clanricarde’s death was said by some to have been hastened by the clash: Wentworth, not unreasonably, said he could hardly be blamed for the man being nearly seventy. 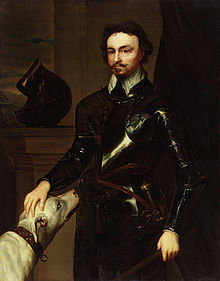 It was however unwise to have made an enemy of the new Earl, Ulick Burke, 5th Earl of Clanricarde, who through his mother Frances Walsingham had powerful English connections: Clanricarde’s half-brother, Robert Devereux, 3rd Earl of Essex, by 1641 was to become one of Wentworth’s (who became Earl of Strafford in 1640) most implacable enemies. It is from the remarkable series of Wentworth’s own letters that we learn best his aims and character. From his first appearance among his Council the gauntlet was thrown down. He made no attempt to be conciliatory, and he prepared for the great struggle against the ‘Graces’ by an attempt to make both the Council and the Parliament subservient to his will. His first demand was that a “voluntary contribution,” made in 1628, early in Charles’s reign, should be continued for another year, to meet the urgent costs of the army and the government. The earlier contribution had been made by the Catholics, but he warns the gentry that on this occasion the appeal would be to Protestants, and he advised them to save themselves by offering the contribution with a request for a Parliament in return. He made them “so horribly afraid that the money should be assessed on their properties that it was something strange to see how instantly they gave consent with all the cheerfulness possible.” The history of this contribution and of the ‘Graces’ with which it was connected leads us back into the previous reign. Even before the time of James I the experiments in plantations had resulted in a general sense of uncertainty and unrest all over the kingdom. No owner of land, whether he were an Irishman holding by immemorial custom and in complete ignorance of English land laws, or the old settler who now saw his property included in the vast tracts claimed on one excuse or another by the Crown, could any longer feel security for his possessions. In the universal fear of losing all they owned Englishman and Irishman suffered alike. In Connacht a confiscation had long been threatened and as far back as 1585, when Sir John Perrot was Deputy, the gentlemen of the province had safeguarded their rights by entering into a pact known as the Composition of Connacht, which secured them in their properties. By far the largest landowner was the Lord St Albans and Clanricarde, whose vast estates about Portumna made him practically Lord Palatine over the larger part of Co. Galway. By some oversight, which it is impossible in the conditions of the time to ascribe simply to forgetfulness, the legal formalities required to make these arrangements binding in law were never carried out. The enrolments were not correctly entered, and though in James’s reign a sum of £3,000 had been paid by the landlords to the King for the completion of their patents, it was found that there were legal flaws in them which permitted the Courts to regard them as a dead letter. It was now proposed to take advantage of these flaws to carry out the general confiscation and replantation of the province. The new plantations in Ulster, Wexford, and Longford gave urgency to the claims of the Connacht gentlemen to have their rights made clear; and early in Charles’s reign they approached him with a petition embodying their desires. Charles received the representatives graciously. He was intent on making himself independent of his English Parliament, and for this purpose he was anxiously looking elsewhere for the necessary funds to carry on his government. The result of the agreement made between him and the Irish gentry was the confirmation of certain privileges to the Connacht landlords, called ‘Graces,’ in return for a voluntary contribution from them of another sum of money, this time £120,000, to be paid in quarterly instalments spread over three years. The Graces originally contained fifty-one articles dealing with a number of matters relating to the better government of Ireland, such as the regulation of trade, the excesses of the soldiery and their support, the oppressions of the Court of Wards, the non-residence of landlords, and the maladministration of justice in the courts of law. But the two Graces  most eagerly sought after were those clauses concerning the surrender of titles in Connacht and Clare or Thomond, and for the recognition of a sixty years’ title to property, as settled by the Act, 21 Jacobi, but since brought seriously into question. The first of these Graces demanded the legal enrolment in Chancery of the surrenders of property made under James on the faith of his promise of confirmation of their titles, for which they had so long waited; the second made illegal the ancient and half-imaginary titles of the Crown to lands, such as had been made the excuse for the Wexford and other plantations, and confirmed the present owners in their rights. Though Wentworth’s contribution to Irish cultural life should not be undervalued: it was under his patronage that the Werburgh Street Theatre, Ireland’s first theatre, was opened by John Ogilby, a member of his household, and survived for several years despite the opposition of Archbishop James Ussher. James Shirley, the English dramatist, wrote several plays for it, one with a distinctively Irish theme, and Landgartha, by Henry Burnell, the first known play by an Irish dramatist, was produced there in 1640. Thomas Wentworth, 1st Earl of Strafford (13 April 1593 (O.S.) – 12 May 1641) was an English statesman and a major figure in the period leading up to the English Civil War. He served in Parliament and was a supporter of King Charles I. From 1632–39 he was Lord Deputy of Ireland, where he established a strong authoritarian rule. Recalled to England, he became a leading advisor to the king, attempting to strengthen the royal position against Parliament. When Parliament condemned him to death, Charles signed the death warrant and Wentworth was executed.